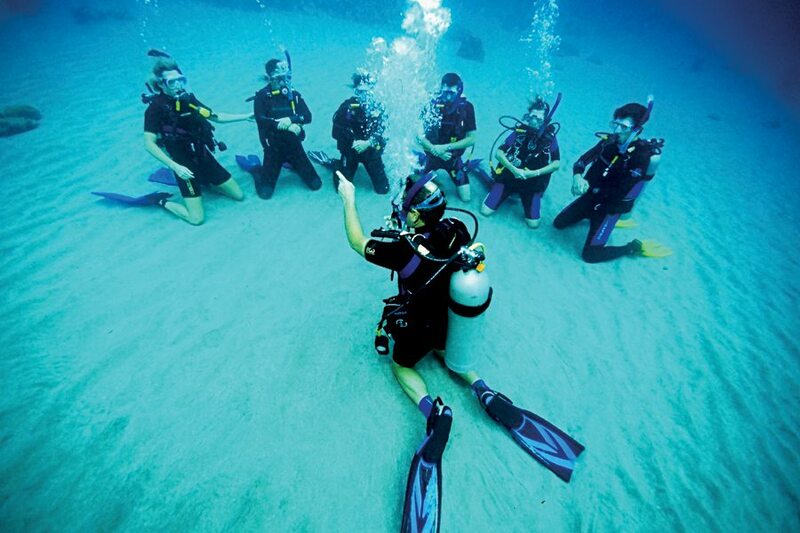 PADI Open Water Diver course, the PADI Instructor takes you through the basics of learning how to scuba dive. You start in a pool and progress to the open water (ocean) getting the background knowledge along the way. PADI Open Water Diver certification is just the beginning. As a certified diver, fabulous dive destinations, exciting people, unparalleled adventure and uncommon tranquility await you. And, as you continue your adventure and gain experience through higher training levels, your opportunities expand. For more details on the PADI Open Water Diver course, Click here. 10yrs for Junior Open Water Diver and 15yrs for Open Water Diver. Good health, reasonable fitness and comfort in the water. Materials: PADI Open Water Crew-Pak, Log Book. Equipment during the course includes: mask, fins, snorkel, tank, regulator, buoyancy compensator, submersible pressure gauge and exposure protection.